Spend some time on the Malecon. The Malecon is a modern, wide walkway that runs alongside a good portion of the lake in Chapala. Lined with Palm trees and tropical plants, the lake is on one side, and restaurants, hotels, a fountain, a skateboarding park, and small trinket shops are on the other. Wrought iron benches face the lake so you can sit and enjoy your morning coffee while daydreaming over the water. Or you could walk you dog, jog the length of this walkway or even skateboard or roller skate along enjoying the scenery. During the week this area is peaceful and you’ll have it all to yourself in the mornings. At night, the palm trees are lit up with decorative lighting and makes for a romantic scene. On weekends tourists from Guadalajara jam pack the place. Ice cream, balloons, food, and pony rides are all for sale. Musicians wander in this area playing for a few coins. The stress of living in the States can take its toll on your health. People say that living in Chapala adds ten years to your life and we believe it. The relaxed Mediterranean lifestyle, clean air, great food, friendly people and just plain fun is bound to extend your life. What are you waiting for? Keep your retirement dreams alive. Many North Americans have already made the move. Go to Chapala’s Plaza. You can people watch here most any time of the day or evening, or chat up the taxi drivers. It’s a good idea to make friends with a driver or two. On Sunday evenings there is music – either live in the Gazebo or recorded and played through the speakers. Sometimes there are dance lessons given, and often people go there to practice their moves. Visit the San Francisco Cathedral. It’s a peaceful place and a great location to catch a quiet moment. You can practice your yoga breathing, calm your mind, pray for a friend or family member. Saturdays can be busy with weddings, baptisms or other church functions, and on Sundays there is the well-attended weekly mass. Go to Cristiania Park. Like to walk? Jog? Play tennis or volleyball? Meet new people? Cristiania Park is the place to do all of these things. One very large park, it is a source of greenery, social connection and a place to breathe in the scent of nature. One scenic trail is to start at the Malecon, walk all the way down to the restaurants at El Pescador (the statue of Jesus the Fisherman) and take a left. Go up this road past the Red Cross until you enter Cristiania Park. Walk the park, play some ball, or have a chat with the local ExPat community. Watch the sunset at the lake. Take one of the benches and relax, watching the sun make colors on the water and the clouds pass through the sky. Or walk the whole length of the malecon, listen to the music played by the minstrels or coming from the restaurants, and take photos of the natural event which is different each evening. Take a selfie at the multi-colored CHAPALA sign down by the Beer Garden. Enjoy the Margaritas at the Cozumel Restaurant. Well… the food you have to pay for, but the Margaritas (or wine) are free with your meal. No kidding. Relish in the Trout Almandine, the Bacon Wrapped Shrimp, the Arrachera or the Battered Deep-Fried Shrimp. Walk off your meal by making your way up to the pier or past that to the large CHAPALA sign. Go to the Chapala Monday Market. Called tiangis (tee-AN-gees), every Monday on the main road past the gymnasium towards Soriana Grocery Store, vendors gather to sell their wares. Everything from fresh fish, meat, freshly de-feathered chickens, local honey, fruit, and vegetables, to clothing, household items, electronics, tools, herbs, CDs, DVDs and more are sold here. Depending on the Monday, it can be a good photo opportunity. Go to Chapala’s main market at the Plaza. This is Mexico in action. Meat markets, fish markets (upstairs), fruits, vegetables, juice shops, restaurants, chickens being roasted on a rotating spit, fresh yogurt, eggs, cheese, local honey and bee pollen, tacos, sandwiches and more are all available here. Enter from the Plaza, from Juarez in the back or either of the side streets. Take a look around, and be prepared to capture some live action! Enjoy the climate. 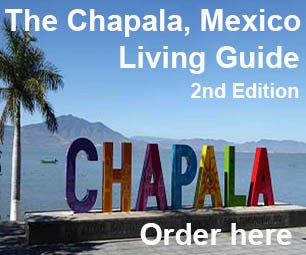 With year-round spring like temperatures, Chapala is an easy town to walk around. Most everything you need is within a short distance or take a seat on one of the many benches provided in between your gallivanting around. It’s hard to be in a bad mood when you are surrounded by so much beauty. Practice your Spanish, enjoy the kindness of the Mexican people. It’s easy to make friends here in Chapala. Just start out with an “Hola” or “Buenos” and start chatting, especially with the vendors. You will soon get to know them, because if you are walking around for any length of time you will become familiar with the same places and faces. Practice your Spanish and they will be thrilled to participate. Ask them what fruit is best today or where they get their honey or which part of the carnitas is best to buy. Ask them how they are today, or if they have children (they do) and go from there. Before you know it, you’ll have made a buddy and will be waving at each other on a daily basis. Enjoy a cup of coffee at a café. There are a couple of coffee houses in Chapala, The Coffee Hour by the main fountain and El Arbol de Cafe on Hidalgo on the way out of town. There's also a new shop on Morelos and Zaragoza called Buenos Ayres. All serve good coffee and good breakfasts, just depends on what kind of crowd attracts you. El Arbol de Cafe (The Coffee Tree) has better cheesecake and their breakfasts tend to be Mexican style. They also sell fresh roasted beans, ground for you special that moment when you purchase them. They are good places to meet people and watch pass the morning. The Coffee Hour is open daily, The Coffee Tree is closed Sundays. Buenos Ayres has various hours. Take a bus ride to the next town or to Ajijic. This is a very affordable way to get out of town and check out what's going on elsewhere around the lake. For 8-9 pesos, hop one of the buses and go to San Antonio or Ajijic and visit their plazas, coffee houses and restaurants. Walk around town, take some photos or make an out-of-town friend. Have a Gelato. Italian Gelato is available in Chapala and it's very good. Located on Ramon Corona past the Braniff Building you will see a closet-of-a-shop that sells the most delicious flavors. The store is owned by an Italian father and son combination and they make their ices fresh. Have a beer at the tennis courts or at the Gavilan. While there are lots of places to have a brew, two of the most interesting are at the tennis or volleyball courts in Cristiania Park and at the Bar Gavilan on the corner of Lopez Cotilla and Cinco de Mayo. The tennis courts have outdoor seating with sporting entertainment and offers good social connection. Mornings are the best time, late mornings for a brew. El Gavilan is one of the remaining true Mexican cantinas and is worth a visit. With swinging wooden doors at both of its entrances, this previously male-only bar is now run by a woman named Patty which has seriously changed the vibe from the olden days. If you have never visited one of those bars you'd see in an old Western Movie, make a point of stopping here. Generous wine pours, good tequila and rum, and of course your choice of beers. Afternoons and evenings are best. Good prices. Enjoy fresh tacos on the street. You cannot separate Mexico from her tacos or tacos from their home country of Mexico - it's the flavor south of the border. For lunch and dinner, taco stands will set up on the street around the Plaza. You have choices of Al Pastor, Barbacoa, Adobado and Sausage and Potato. For about fifty-cents a taco you will taste the real deal. If you are lucky, they will have grilled sweet onions available also. Dress your own tacos with raw onions, cilantro, habanero chili, and red or green chili sauce. It's a must-try.